Harefield slalom site is located along Coppermill Lock by the 'Coy Carp' pub, on the Grand Union Canal, approximately 1 mile from Harefield town centre and 3 miles from M25 junction 17. The place is often referred to as ‘The Fisheries' which was the pub’s previous name. Ben Collins recommends it as an excellent location, especially for beginners. There's nothing formal organised, but Purley Canoe Club turn up Sunday mornings in play boats quite often. 3 informal sessions a week, 6pm-7pm on Mondays, Wednesdays and Fridays. The flow is created by water flowing through two sluice gates, making for an easy grade 1 - 2 most of the year. 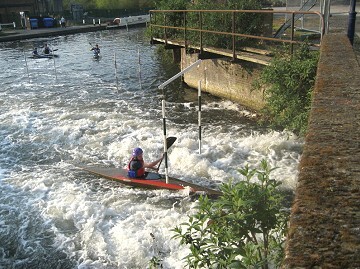 St Albans paddlers use the site all year round as a training site with permanent gates. The training sessions make for an ideal introduction for beginners and a good place to learn white water canoeing skills. 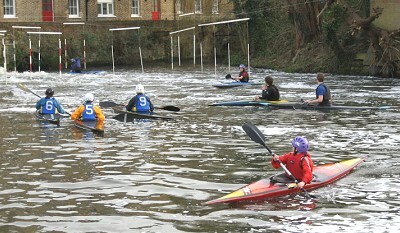 In fact a number of British team paddlers learnt their initial skills at Harefield! Access is from the canal bank across the road from the public house car park (although the car park cannot be used by competitors during the event at the end of July). It is recommended that you wear something on your feet as you will have to walk across the car park and along the road to the canal bank to the access point. During winter months the water levels can change quite quickly, going from small jets to large jets of water through the sluices with some quite strong eddy lines and strong currents that can catch out even Premier and Division One paddlers. During the summer we maintain a reasonable level of flow except in the driest spells! At the slalom, camping can be found behind the pub car park in an adjacent field about 100 metres from the slalom site.